In February, the Westin Kierland launched the "Crafted at Westin" cocktail program, and I was recently invited to a media preview. Every Saturday through April 30th, Crafted Cocktails with Matt invites guests on a 90-minute journey into the world of cocktails. Our group met at Nellie Cashman's Monday Club Café, named after “The Angel of the Mining Camp", known for her charitable works and hospitality to the miners of Tombstone, Arizona in the 1880s. We were warmly welcomed by Jessica Wrubel, Communications Coordinator, and Jennifer Franklin, Director of Communications. Our class started with AZGNTs, a refreshing and sophisticated version of a gin and tonic made with Arizona Distilling Company's Commerce Gin, John's Premium Tonic, and AZ Bitters Lab Orange Sunshine bitters, along with an enticing array of cheese and snacks. As we gathered around our cocktail stations, Jennifer told us about Resort Mixologist Matt Allen and the outstanding beverage programs in the various dining venues on this beautiful property: The Muddle Bar and acclaimed South American wine list at Deseo, the Rim Bar in the lobby focusing on fresh ingredients, Waltz & Weiser Whiskey Bar and Cantina specializing in whiskeys and tequila including Westin's exclusive double barrel Casa Herradura reposado tequila , Brittlebush Bar and Grill and its Arizona craft beers and golf-themed cocktails such as the Double Eagle Margarita, and the Scotch Library with 225+ whiskies in the collection. "We’re really proud of Matt Allen, " Jennifer told us as she introduced our guide for the evening. "He has really brought our beverage program into the forefront and has had a hand in developing just about all of the cocktails all over the property." Matt tells us what's in store . “The premise of the class is 'Crafted at Westin', the program we have in our lobby bar. The focus is on artisanal spirits, local ingredients, fresh herbs, fresh citrus, the use of bitters, and housemade syrups. 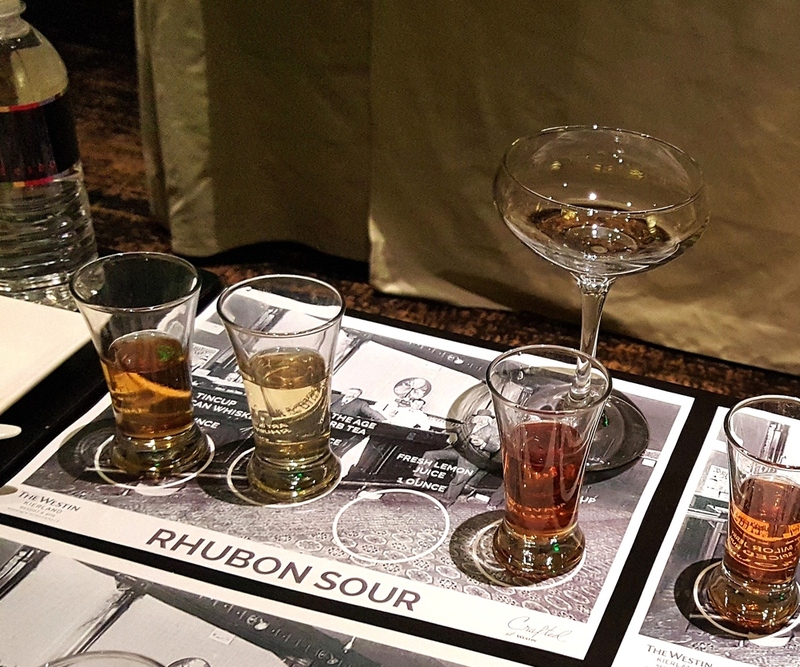 The purpose of this class is to get hands-on experience in putting together a cocktail, to introduce you to some spirits that you may not otherwise encounter, and to give you a little history and knowledge." We get ready to make drinks as we admire our comprehensive set-ups, including spirits, liqueurs, basil, lemons, bitters (cardamom and lavender), cobbler shakers, juicers, and jiggers. We are told the three cocktails we are going to learn - the Miner's Wife, Rhubon, and Caribbean Cafe - were created by Matt to follow the style of those found in the Rim Bar, but are not on the current menu, which makes this class a special treat. To pair with each cocktail, the Chef prepared three dishes: Olive tapenade and manchego on ciabatta with honey drizzle, slow-roasted lamb with Granny Smith apple relish and micro beet greens, and a chocolate tart with hazelnut and spun sugar. We start with the Miner's Wife as Matt gives us a tip: "Start with the least expensive ingredients first, ending with the base spirit in case you make a mistake along the way and have to start over." Made with Bar Keep organic lavender bitters, basil, lemon juice, pink peppercorn syrup with local honey, Carpano Bianco vermouth, and Desert Diamond Distillery vodka from Kingman, Matt walks us through mixing and shaking as we learn about bitters and vermouth (always refrigerate!) along the way. It's a perfect cocktail and aptly described by Matt as "a balanced drink where you get some of the floral notes from the vodka and lavender." Next is the Rhubon Sour, a variation of a classic whiskey sour, using Tincup American Whiskey from Colorado with Art in the Age Rhubarb Tea liqueur, lemon juice, agave syrup, cardamom bitters and egg white. Matt instructs us on the double shake technique when using egg whites (first a dry shake with no ice for 10 seconds, and then shaken vigorously with ice added). Verdict? One in our group remarked, "I could have five of these!" We finish with another Matt Allen winner - a dessert cocktail called the Caribbean Cafe, an addictive blend of Sailor Jerry's spiced rum, St. George NOLA Coffee Liqueur, orgeat almond syrup, and almond milk, finished with a fragrant dusting of grated nutmeg. I've attended many cocktail classes, but this is one of the best yet - wonderful crafted cocktails, an excellent teacher, and thorough hands-on demonstrations and techniques. Each Saturday class (4 to 5:30 pm) is $50 per person and includes light appetizers, three cocktails, a cobbler cocktail shaker to take home, recipe cards and a discount on appetizers at the Waltz & Weiser Whiskey Bar and Cantina. For reservations, call 480-624-1268. I'm already making plans to get some girlfriends together for another session. I received a media invitation for this preview.